In 1952, Gibson launched its first solidbody electric guitar - the Les Paul Model. Although this seminal instrument would eventually evolve into perhaps the most iconic guitar in Gibson’s history (the Les Paul Standard ’Burst), and subsequently command the highest prices of all on the vintage market, by Gibson conventions it was relatively modest in terms of decoration at the time. A rosewood fingerboard, nickel-plated hardware, minimal single-binding and the absence of fancy headstock inlays deemed it a fairly staple, mid-priced design in comparison with other fancier models. The stage was set for a more elegant version of the Les Paul electric guitar - one that would appeal to the upmarket musician (and quite possibly look good while wearing a tuxedo!). 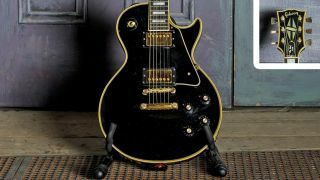 Enter the Les Paul Custom in 1953 aka the ‘Black Beauty’. 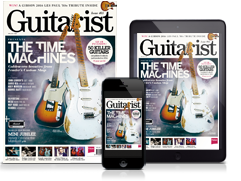 With a suave ebony finish, ebony ’board, gold-plated hardware, multiple-bound top and back, and split-diamond headstock inlays (as seen on Gibson’s flagship jazzbox, the Super 400), it was a guitar that looked like it meant serious business. Shortly before the release of the Les Paul Model, electronics designer Seth Lover had created a new pickup known as the Alnico V (aptly named after the alloy in the pickup magnets) and it was on the Les Paul Custom that this pickup made its solidbody debut in the neck position. Along with a ‘soapbar’ P-90 installed in the bridge and an optional added Bigsby, this was one classy looking guitar with a whole new range of sounds. Perhaps Seth Lover’s greatest gift to the world of guitars, however, came in the form of the humbucking pickup, with the Les Paul ‘Goldtop’ Models and Les Paul Customs progressing to this new design in 1957. This leap forward in guitar electronics replaced both P-90 pickups on the Goldtops and both the Alnico V and P-90 pickups on Les Paul Customs. But to keep the pecking order in place between the two, an additional third humbucker was added to the Custom (aside from a limited number of rare examples). With demand for the single-cut Les Paul guitar range somewhat flagging in the late 50s, a new double-cut body shape was introduced starting with the lower budget Les Paul Junior and Les Paul Special guitars in 1958 and 1959 respectively, which first received a rounded double-cut, only to be swiftly transitioned into the ‘pointed horns’ double-cut SG body design in 1961. Les Paul Standards moved directly from single-cut to SG body shape in late 1960 and, ultimately in 1961, the Les Paul Customs received the same treatment, marking the end of an era for these classic guitars. Remaining dormant for the largest part of a decade, it wasn’t until 1968 that the original single-cut design was reintroduced with double pickups as demand began to grow, mainly among rock musicians. A far and unexpected cry from the jazz scene of the early 50s, but it was here that they really came into their own as an instrument of choice, and to this day they remain one of Gibson’s most popular designs.